Heat gas or charcoal grill. Spray pizza pan or cookie sheet with cooking spray. Remove cookie dough from package; press into disk shape. On pizza pan, roll dough into round about 1/4 inch thick. Place pan on grill over medium heat. Cover grill; cook 15 to 20 minutes or until cookie is light golden brown. Remove from grill. Sprinkle graham cracker pieces evenly over cookie; top with chocolate bar pieces and marshmallows. Return to grill; cook about 2 minutes longer or until marshmallows are golden brown. Cut into wedges. Serve warm. Love making s’mores? Then you’ll love this cookie pizza! It’s perfect for camping or a backyard barbecue. After grilling your dinner, leave the grill on to make dessert. To keep dough from sticking, roll between 2 sheets of cooking parchment paper. To have a perfectly round pizza, after rolling the dough, use a 9-inch cake pan turned upside down as a “cookie cutter.” Place the trimmings on top of the dough and roll again. Oven Method: Heat oven to 350°F. Prepare pan and dough as directed in step 1. Bake 15 to 20 minutes or until cookie is light golden brown. Top with graham cracker pieces, candy bar pieces and marshmallows. Set oven control to broil. 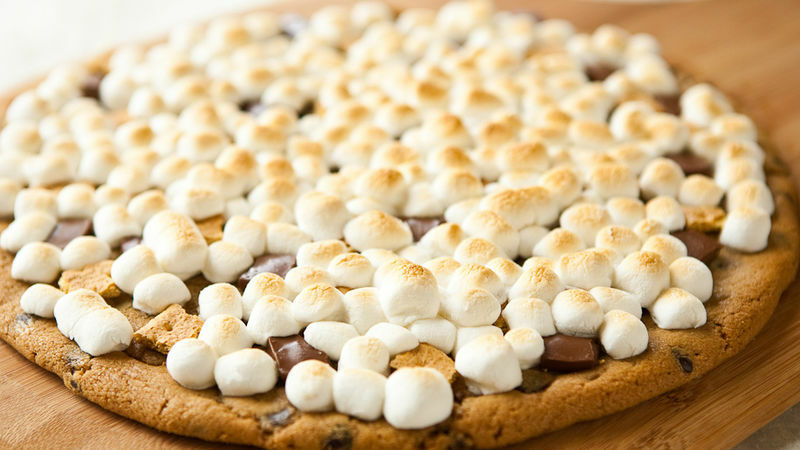 Broil cookie pizza about 2 minutes or until marshmallows are golden brown.